I’ve been working on a VR project (VR Music Sequencer) the last few months as part of the Metanaut team (which I am Co-Founder of), some updates to come in the next 1-2 weeks. With one of my team members, we’ve come up with common controls across HTC Vive, Oculus Touch, and an XBox controller (which is to come bundled with the Oculus CVR). This was for mapping out controls for our sequencer, as we’d like to support as many platforms as possible on release in the future.We’ve done extensive research about the controllers, as well as contacted the actual hardware developers from both Oculus and Valve about the controllers, so these details should be quite accurate. 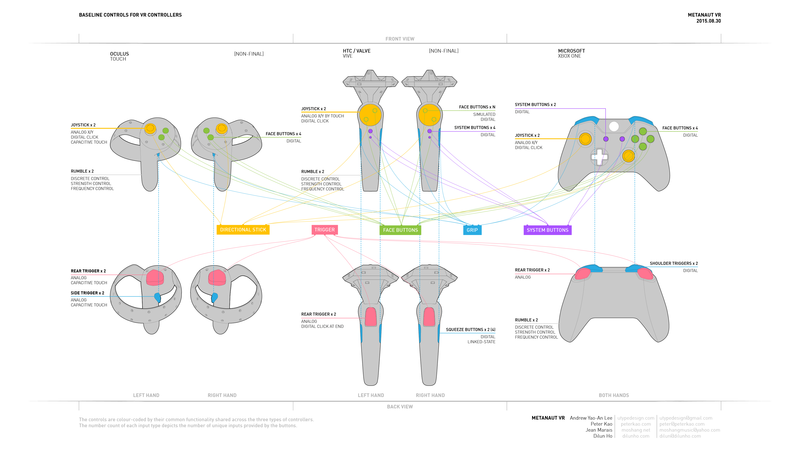 We were pretty frustrated at the lack of knowledge and consistency in details about the VR controllers, let alone finding a single site with all the controllers together. This chart was made in August 2015, and it still applies for now. Note that the Oculus Touch control specs are not 100% confirmed, and that these are the HTC Vive developer kit specs. In the last month we’ve added support for Leap Motion in VR mode. It’s been quite exciting working with 3 others, and seeing everyone on the team work hard towards achieving a functional prototype of the sequencer. I don’t know if it’s weird to appreciate the fact that everyone is working hard, but all group projects I’ve worked on in the past have always had very imbalanced work distribution, and I’d always end up doing most of the work. So it’s been quite a relief seeing everyone do critical work in their respective portions.